After filming sights along the Road To Hana for 11 hours on Monday, there are a few striking lessons learned. 1. You can’t possibly see everything in 1 day. I’ve been to Hana dozens of times, and I know where to go and see the best views, waterfalls, coastlines, and forests. Even so, in order to get the best video possible, I did research for 2 weeks to pinpoint the best spots that I could visit. That being said, it was a whirlwind trying to see all of them in a day. I couldn’t do it. So, I had to use some older footage as well. Stay the night and do the Road to Hana over at least 2 days. Travaasa Hana Hotel has some great accommodations right on the water in Hana Town. As beautiful as the sights were, I didn’t enjoy traveling to Hana Town as much as I have in the past. It was incredibly stressful rushing from one spot to the next. Do yourself a favor and enjoy a few spots and take your time while there. It’s the only way to really get a feel for Hana. It’s not that all tourists make mistakes, but there’s a solid 5% of visitors to Maui that are inconsiderate, rude, and down-right stupid. If you’re reading this, you’re obviously not one of these people because you’re doing your reading and due diligence. Let me explain a few situations that got my blood boiling. One of the first shots I took was a time-lapse video of the curving road and cars driving by. To get the shot, I had to park off the road in a spot that only had room for one car. There was nothing there to see other than the road, so I thought it a good spot to stop. 2 girls pulled up behind me, and they began to fiddle with their GPS. I politely explained to them that they should move their car immediately because they were taking the whole lane of traffic on a high=speed blind turn. (admittedly, I was more concerned about my own safety than theirs.) They put their finger up to say that they were almost done. A minute goes by, then another. I repeatedly told them to move the car because it was incredibly dangerous to stop there. By the end, it took me yelling at them and approaching the car in a hostile way to get them to move. Aggressive is the last adjective anyone would describe me as, but my actions very well may have saved all of our lives. What on Earth would make these girls think that it was OK to stop there? I understand what they were doing: they wanted to reset their GPS so that it would correspond with the mile markers. But they could’ve done it further down the road and subtracted a mile or the passenger could’ve done it instead of the driver. I was behind a driver that was going 15 miles per hour in a 45. I understand they want to look around, but when someone is behind you on a small road, you pull over as soon as it’s safe. They kept this going for mile after mile. Just pull over!!! There’s good reason for frustration coming from local Hana residents. Those that visit areas that are on private property without permission, litterbugs, and inconsiderate drivers make up a small portion of visitors to Hana. BUT it only takes a small portion to spoil a good thing. When you travel the Road To Hana, please be considerate, safe, and respect the land and people. 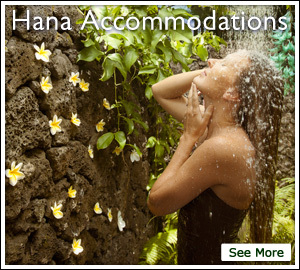 Here are some good Hana Tips. OK, so for those of you curious about the video, here it is in all of its glory! Yes, not every spot is featured, but the best spots are. If you’re saying, “but you missed this spot or that spot!” Well, there’s good reason. We spoke with local Hana residents and we’ve gotten the low-down on what spots they feel tourists have taken advantage of to the degree of degradation. These spots are fragile areas and some are even on private property. Please respect their wishes and stick to the ones in the video. Mahalo! I love you Maui, a truly magical island ! Majestic! People have to realize that this is a historical and sacred place.. to treat it as a spiritual and magical journey..
Good point, Jeff. Though I can understand the temptation to tailgate when you have a line of 100 cars to get through in order to get to work. Still, there’s no excuse. Unfortunately, experience dictates that if you donʻt tailgate, they donʻt pull over. Mahalo for being considerate and letting folks pass as soon as there is a safe place to do it. It is a “two lane road” but SO MANY tourists treat it as their private driveway, locals usually default to what works. And I think we all know that that the posted speed limit and reality are not always the same thing – even on the mainland. Try driving the speed limit on the freeways of California and see how frustrated those locals get. Really nice video! I will put this on my list to send to visiting friends. Mahalo, Elinor! The new website is coming out in the next 48 hours. Go to https://RoadToHana.com on Monday to see it. Mahalo! I actually hate the drive to Hana. I know it might seem jaded because I grew up here but it is a really long windy drive and I get car sick. It is beautiful and there is no better place to see multiple waterfalls but I enjoy my time in Hana much more than the drive there. For me, it’s the destination, not the journey. I can’t imagine living there and having to deal with all the sightseers on a regular basis. I welcome tourism to Hawaii but agree that we all need to remember Hawaii is people’s home and their history as well and to be considerate that not everyone is on vacation and to understand certain cultural implications as well.